Not long ago, while attending a bachelor party on the White River in Arkansas, I saw something I haven’t seen in quite a while: a fishing vest. 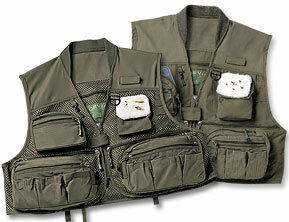 Now I know the fishing vest is far from dead; it remains a stalwart of tackle companies’ sales. But the vest has definitely reduced its presence from the heady days of the 1990s, when a fisherman’s vest defined him as a fisherman. Remember when you could tell just by looking whether a guy was a gear hound (ex: Orvis Battenkill Pro Guide–enough capacity for a traveling circus), a minimalist (ex: Patagonia Mesh Master Vest–see through/sweat through) or a techie (Simms Guide Vest–a place for every bangle, made of sacrificed Apollo astronaut suits*). Nowadays, especially with the under-40 crowd, you just don’t see that many vests. Hip packs, backpacks, chestpack/backpack combos – these have replaced the vest entirely on some water and are increasingly becoming the norm. I myself have two quality vests hanging in a closet that I never use. What are the reasons for this transition? Have anglers all become minimalists to some degree? Or is it just that the last aftershocks of The Movie (which defined a fly fisherman’s ensemble as nothing else ever has or will) have finally worked themselves out? * Ok, I can’t back that up. Let us know your thoughts in the Comments section: we’ll conduct an informal poll and see how many of us are still vest wearers-and why those who wear them still cling to tradition. In a later post I’ll use your feedback to evaluate the best vests on the market.